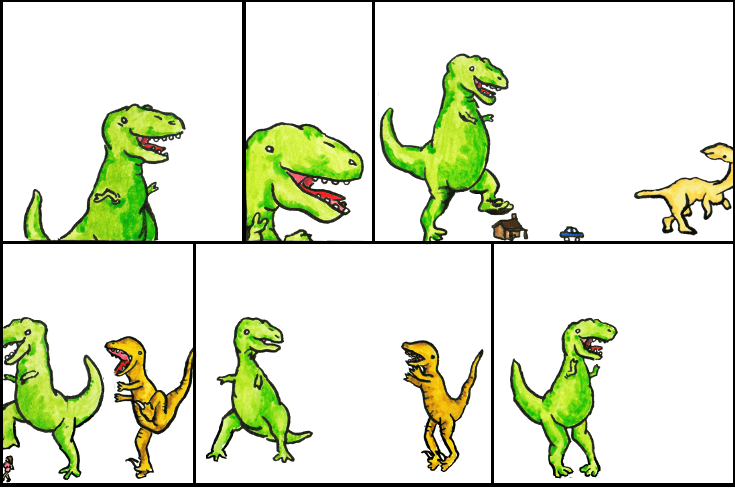 Dinosaur Comics - December 10th, 2010 - awesome fun times! This December 21st in Toronto is the offical book launch party for my new book! It's free, AND there'll be a secret Santa exchange too if you want to participate. This will be a great party and a great chance to get the book on the cheap (no shipping, plus I can sign them to whomever you want! I am THAT FLEXIBLE). You should come! This is a bit of a long shot, but a Dinosaur Comics reader, Joe Sjoberg, has been missing from Madison, WI for over a week. Here's a page with the details - maybe you've seen him? Happy Dog the Happy Dog illustrator and all-around awesome lady Allene Chomyn is a finalist for the YouTube Symphony Orchestra so if you watch her video and think she's awesome and playing notes on a violin, then you should vote for her and she can get a job playing notes on the violin on the internet!